In February 2018, Paris Aéroport welcomed 6.9 million passengers, an increase of 0.9% compared with February 2017. 4.7 million passengers travelled through Paris-Charles de Gaulle (+2.7%) and 2.2 million through Paris-Orly (-2.8%). Traffic was marked by the climatic conditions and by the strike of some air carriers. The number of connecting passengers increased by 0.8%. The connecting rate stood at 22.6%, down by 0.7 points compared with February 2017. 14.5 million passengers. The number of connecting passengers has risen by 2.5%. The connecting rate stands at 24.4%, down by 0.3 point. Passenger traffic at TAV Airports, 46.1%-owned by Groupe ADP, increased by 19.7% in February 2018 compared to 2017 and has risen by 25.0% since the beginning of the year. 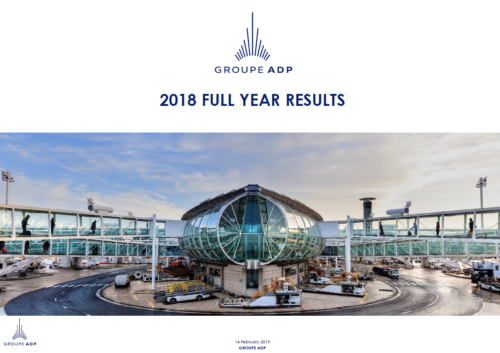 Passenger traffic at Santiago de Chile Airport, 45%-owned by Groupe ADP, has increased by 14.9% in February 2018 compared to 2017 and by 14.5% since the beginning of the year. As for previous years, at the date of the publication of the press release (22 February 2018), these statements had been subject to audit procedures, without the audit reports on their certification being finalized at that date. These reports have since then been issued by the Statutory Auditors. They will be available in the 2017 Registration document.